When I found the runes in December 2008, Odin found me; consequently, I came to know Odin first as Rúnatýr, God of the Runes. As Rúnatýr, he comprehends the many mysteries of the universe as revealed through the runes, which are but one gateway to that knowing. The language of Wyrd is written in these sacred and ancient symbols; therefore, as a master of the runes (among other things), Odin acquires knowledge of Wyrd. For those who are willing to pursue the runes, to strive after their knowing, Odin may bless their ordeal and grant them victory as he chooses. In fact, my study of the runes, no doubt like most people, began with the story of Odin’s own ordeal and sacrifice on Yggdrasil, the World Tree. I remember when I first read the tale of his trial on the Tree, I was deeply moved, taken up by the ōðr (meaning fury, madness, or inspiration) that must have fueled his decision to hang for the wisdom, power, and knowing that the runes bring. It is not insignificant that the runes could not be won without sacrifice of self to self. What it means to sacrifice self to self is different for every person. Early in my quest after the runes, Odin helped me to see that before one can sacrifice self to self, one must know self first! One must know what and where one is before one can freely offer that self in some worthy pursuit. As I discover more of myself, I offer those new aspects of self in order to advance my relationship with the runes and with Odin himself. Fortunately for me, the runes were a gateway to others of Odin’s faces. Rúnatýr kindly introduced me to Gangleri the Wanderer, the seeker after experience, wisdom, and knowledge, for with all these things comes great power, not a destructive, self-serving power but a highly generative power that ultimately serves all the worlds. 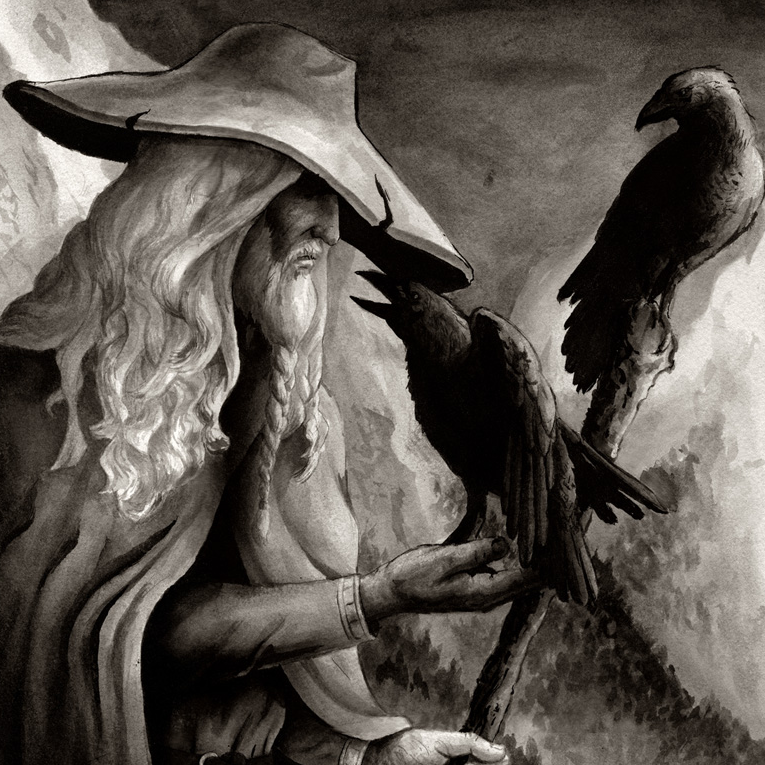 Odin as Gangleri teaches that experience, wisdom, and knowledge do not simply come without journey or effort but instead these things must be sought, courted, and won at no small price to the seeker. Further, Odin is a journeyer at heart and may ultimately serve as Farmagnuðr (or Journey Empowerer) for those who are similarly inclined and can serve some purpose of his. He has been a great guide to me on my personal path and he continues to support my work as I traverse my road’s challenges and forge new paths. Gangleri and Farmagnuðr brought me back to the realization that one must know one’s self before such a process can unfold, that to not know one’s self is a great hindrance, a fetter of sorts and so I came to know Odin as Haptsönir, the Fetter Loosener. This title was often used in reference to his role in battle as a god who could release both physical and psychological fetters, such as fear and doubt, which might paralyze a warrior in the midst of heated combat. Although this title was associated with “literal” battle, I see Odin Haptsönir in my day to day personal battles to know and understand myself better and the immobilizing fear that often grips me in that process. His wise counsel often aids me in destroying what hinders me and in integrating disparate parts of myself for greater wholeness as I pursue various magical and mundane potentialities. As a complement to the many faces presented above, Odin is also a mighty Magician or Vitki and a gifted seiðr-worker and a true-sighted spá practitioner. As a seiðr-man, taught by Freyja (in exchange for rune knowledge), he is very willing to aid (and make use of) those mortals who would seek to learn seiðr. In my experience, he is primarily interested in supporting these magical arts so that mortal men and women can fare forth into the otherworlds, form relationships with the residents of those worlds, and in so doing strengthen the Web of Wyrd, which will ultimately delay (though not avert) Ragnarök. For all Odin’s bright faces, he has equally many grim and dark faces. He has connections to death and the dead, prisoners, hanged sacrifices, bloody battle, and terrifying magics. For instance, as Yggr the Terrible One, Odin is the leader of the Wild Hunt (a spectral procession of maimed warriors, wild-eyed fire-breathing horses, ghostly rabid hounds, sacrificed Kings, and long-dead ancestors) through the black sky on each of the twelve nights of Yuletide. Although I have had glimpses of him in some of these more grim guises and hope to know them more fully with time, most of my work of late has been with him in his magical wanderer aspects. In my experience, Odin at his core is a god of fury, might, passion, and inspiration at all levels of being. Whether he consorts with poets or warriors, witches or kings, the living or the dead, he is the consciousness and the animating spirit of the world, always seeking, always becoming, and always encouraging the same in those he chooses. Odin has revealed himself to me as an approachable and interpersonal god who is willing to help those who would help themselves as long as they approach him with respect and proper hospitality. Although Odin may make himself available, he does very little if anything without complementary action on the part of the person with whom he is interacting. He expects and demands reciprocity, balance in all things. For this reason, the quickest (not necessarily the easiest) way to his heart (or at least to his attention) is through sacrifice. Offer to him, with appropriate frequency and with some discretion as suggested in the Hávamál (stanza 146), and he may just offer to you. Hail Odin! References/recommended sources for additional information on Odin are given below. For the full citations, feel free to contact me. Pretty cool. Thank you for posting this article. To whose dissertations are you referring? Greetings! I’ve been away from blogging for quite some time so I apologize for not responding to your question sooner. Per your request, here are the full dissertation citations. I hope you enjoy them! Your writing is very good thank you for this :). And what ideas do you have about the offers you are talking about. For example,what do you offer? I believe in Odin also and i think you have a good believe in him, i have never looked at it as in the way you describe it. Hi Nick, thank you for your comments! When I offer to Odin, I give mead usually; I like White Winter Winery’s dry mead. I also give beer if I do not have mead on hand, typically Honey Weiss or Honey Brown. I also like to use incense when I feel moved to do so. I see the All Father as that of our paternal father. He sees the ordeals ahead, and seeks us to learn from these ordeals, providing aid in many forms. What may seem as one disaster may infact be the beginning of a new path. I have gone through this many times, and have only now realized the learning inherent in this “misfortune”. You have done well to interpret the All Father. Keep on the path…for it is one that never ends. Baron, thank you. I really appreciate your commentary on Odin as the insightful father who knows what we will face and offers resources to help us meet the challenge. I also appreciate your comments about ordeal, disaster, and new paths. Many thanks for leaving your thoughts on the Allfather! Hail Odin! Great stuff about Odin!